AU students enjoying their time in Brussels, Belgium. The Kogod School of Business and AU Abroad are thrilled to launch the Brussels Business Internship Program, adding to the University’s 100+ study abroad program offerings. The Internship Program gives Kogod students, preferably rising juniors or seniors, the opportunity to study and work in Brussels, Belgium for a semester. Participants take courses at the KU Leuven – Brussels Campus, intern with an organization in the city, and are actively integrated into Brussel’s culture through various clubs and social functions at KU Leuven. Students collaborate with an Internship Coordinator at the AU Brussels Center, the program’s site in the city that houses faculty and staff office space, meeting rooms, and study areas. They are matched with organizations in Brussels and the surrounding region, and are expected to work at least two days a week. Perhaps the greatest cultural immersion students receive, however, is through their homestay. Program participants reside with families throughout the city, giving them the chance to experience Belgium culture in its entirety. Homestay families provide breakfast daily and three evening meals weekly; students receive an additional stipend for meals outside of the home. 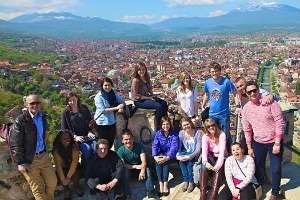 AU Abroad offers a number of scholarship awards each semester ranging from $250 to $2,500. Students interested in receiving aid must fill out a separate awards application. Applications for Spring 2017 are due by September 15, 2016. Learn more about the program and submit your application today!